Happy New Year to my Jewish friends. This is the Jewish year 5772. While much of the world has adapted to the western calendar, more properly known as the Gregorian calendar, other cultures and religions also celebrate their own new year. Muslims, Jews, and the Chinese are among the most notable of those who celebrate two new years, the western one and their own. Rosh Hashana is Hebrew for "Head of the Year". The holiday is established in Leviticus 23:24 and is declared to be a day of rest. It will often be celebrated with "round" food items intended to resemble the "head". People will greet one with the Hebrew greeting of Shana Tova "Good Year" or Shana Tova Umetkah "A happy and Sweet Year." Rosh Hashana also signals the beginning of the Jewish Holiday season. Next week Jews will celebrate Yom Kippur and after that Sukkot. 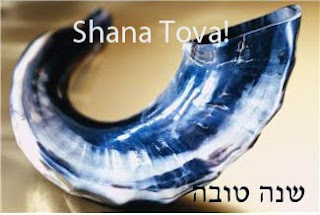 Shana Tova to my Jewish friends and readers.